Afghan election workers move ballot boxes to the Independent Election Commission (IEC) warehouse in Kabul on September 19 in preparation for counting. KABUL – Election officials have begun counting votes in Afghanistan to determine the winners of nationwide parliamentary polls. The counting, which will take days to complete, comes as the toll from Taliban efforts to derail the process has become clearer. The Interior Ministry says that at least 11 civilians and three police officers were killed during the voting on September 18. The attacks included 33 bombings and 63 rocket strikes nationwide. NATO's International Security Assistance Force (ISAF) put the number of casualties higher, at 22, including Afghan and foreign soldiers killed battling the Taliban. But there were far fewer attacks than during Afghanistan's previous election – the presidential poll last year. Afghan officials said today that the September 18 polls saw 305 violent incidents, compared to 422 incidents during presidential polling on August 20, 2009. It is still uncertain to what extent the violence discouraged voters from turning out. The turnout will only become clearer as the ballots are counted. However, the Election Commission said that preliminary data showed some 4 million people cast ballots. Fazil Ahmad Manawi, head of the Independent Election Commission, said that "this makes 40 percent of the maximum number of voters," but stressed it was not a final figure. Manawi also said the bodies of three election workers kidnapped on September 18 have been found. "I have unfortunate news regarding three of our workers who were kidnapped yesterday in Chemtal district of Balkh Province," he said. "They have been killed, and we found their bodies today." 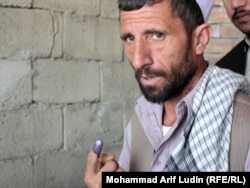 Afghan officials have praised the election as running smoothly, despite the country's security problems. Some voters say the ink used to prevent repeat voting easily washed off. However, there were widespread complaints from voters during the polls, which already are raising concerns about potential fraud affecting the vote count. 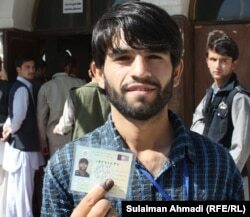 The Free and Fair Elections Foundation of Afghanistan (FEFA), the country's largest independent poll monitor, said in a statement that it "has serious concerns about the quality of elections," given the insecurity and numerous complaints of fraud. "Ballot stuffing was seen to varying extents in most provinces, as were proxy voting and underage voting," FEFA said. FEFA's Executive Director Jandad Spinghar told Radio Free Afghanistan that for the election to be considered free and fair the complaints must be fully addressed. “If these types of complaints are not being dealt and are not solved legally through all available relevant mechanisms, like the complaints commission and the Election Commission, then it could have a negative impact on the credibility of the election," he said. Some voters said that the ink used to stain their fingers easily washed off. And in some polling stations, observers said poll workers were letting people vote with obviously fake voter registration cards. Both the ink, which is supposed to last 72 hours, and the checking and hole-punching of voter registration cards is meant to prevent voters from voting more than once for their candidates. The concerns about fraud are particularly sensitive due to the experiences of last year's presidential election. That vote was marred by massive fraud in the first round, leading to President Hamid Karzai being reconfirmed in office after his challenger withdrew, saying a fair election was impossible. An Afghan man proudly displays his registration card after voting in Kabul. This time, election officials have repeatedly said they have put better controls into place to detect cheating. The extent to which that proves true will directly affect public confidence in the poll. Both the Afghan government and its international backers hope that an election seen as legitimate would strengthen support for the Afghan administration. The support is seen as crucial for rolling back the Taliban, which has dramatically revived in recent years, partly due to public anger over poor governance and corruption. NATO Secretary-General Anders Fogh Rasmussen today praised the courage of Afghan voters and vowed continuing support from the military alliance for Afghanistan. "NATO will continue its engagement on behalf of Afghanistan, as the people and government create a secure future for themselves and one that will also bolster international security," he said in a statement. In a statement, the European Union said "these elections constitute an important and visible sign of Afghan sovereignty, and underline the will of the Afghan people to shape the future of their country." UN Secretary-General Ban Ki-moon also praised voters for their "courage and determination," while the UN's top diplomat in Afghanistan, Staffan de Mistura, says it's "premature" to call the vote a success. He said the country's elections commission had done a "great job" but advised, "I would wait to talk about success." Full preliminary results are not expected until early October, and then there will be weeks of fraud investigations before winners are officially announced for the 249 parliamentary seats. Some 2,500 candidates took part in the contest to fill the seats of the lower house of parliament. The lower house has the power to approve or reject laws proposed by the government and to approve the president's choice of ministers.